It can be very dangerous to have a Spyware app on your iPhone. Not only can the person spy on you and violate your privacy, they can also get your vital information from your iPhone such as your bank information or address. That’s why it is very important to remove spyware from your iPhone as soon as possible. Before Removing: Does a Factory Reset or iOS Updating Remove Spyware? - Nope! Best Spyware Remover: How to Remove Spyware from iPhone? Does a Factory Reset or iOS Updating Remove Spyware? - Nope! A lot of people think that performing a factory reset will remove the spyware from their iPhone. This is not correct. While factory reset does remove all your data including the spyware app(s) from the device, there is still a possibility that the spyware will be installed again. The reason behind this is that the usual factory reset does not remove data permanently and some remnants of the stubborn spyware app still remain when you reset the device. Another reason is that most people backup their iDevices before resetting them. When the data is backed up, the spyware app also gets backed up to iCloud or iTunes. And when you restore from that backup, the parts of the spyware app are also restored. Hence you are likely to find these remnants of the spyware app if you rescan the device with a spyware scanning software. Updating your iPhone’s firmware also has a similar effect. However, it is relatively less extreme. Your data and apps are not removed during a firmware update, but there are chances that the spyware will be removed. If you want to remove spyware from your iPhone, then it is recommended that you completely reset your device. The default factory reset method as mentioned above, does not remove data permanently and the remnants of the spyware app remain. The complete factory reset on the hand, wipes your iPhone’s storage completely and permanently, so you get rid of the spyware for good. iMyFone Umate Pro iPhone Spyware Remover is a data erasing software that uses a security standard to the U.S. DoD 5220.22-M, so data removal is 100% permanent and there is no chance of recovery. So you can perform full factory reset with this software and get rid of the spyware for good. Most data erasing methods/standards use simple overwrite techniques and write the same data everywhere. This does not ensure permanent data removal. DoD 5220.22-M on the other hand, is a different technique/standard to overwrite. It prevents data from getting retrieved via methods that all data recovery softwares use. Not only are software-based data recovery methods prevented, the hardware-based data recovery methods are also prevented with this data sanitization method. So if a data erasing software uses DoD 5220.22-M standard, then you can be sure that it erases data permanently and makes it 100% unrecoverable. Best Spyware Remover for iPhone since 2016. 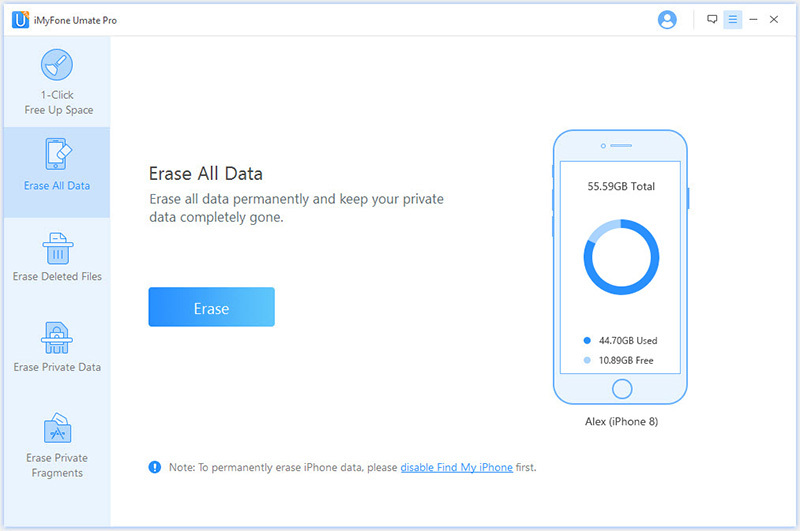 Permanently erase all data from your iPhone (complete reset) in the most efficient and convenient way possible. 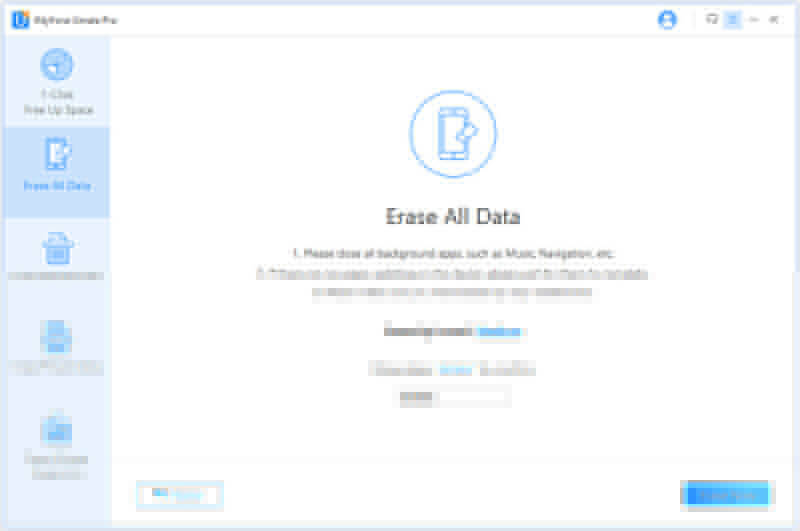 Permanently erase private data such as your photos, music, videos, contacts, messages, call history, as well as data from third-party apps such as WhatsApp, Kik, Viber, etc. Scan for deleted files and erase their data traces permanently so that they cannot be recovered by any data recovery software. Protect your privacy by erasing private data fragments that third-party apps store on your device from time to time. Boost the performance of your iPhone by cleaning up its temporary and junk files via 1-Click Free Up Space mode. iMyFone Umate Pro iPhone Spyware Remover is fully compatible with iOS 12 and receive lots of positive reviews from Cultofmac.com, Makeuseof.com , macworld.co.uk, etc. Here are some features of it. 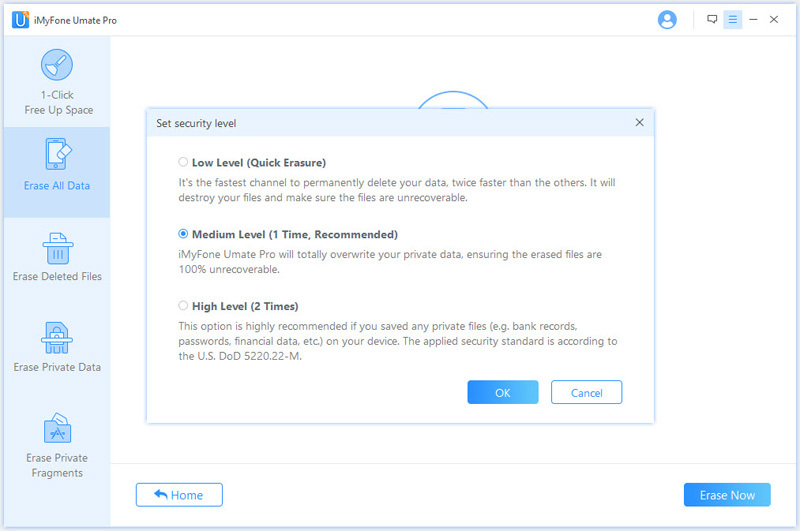 First you need to install iMyFone Umate Pro Spyware Remover at your Windows or Mac computer. Step 1. Connect your iPhone to your Windows PC or Mac and launch Umate Pro. It should detect your connected iPhone automatically. Step 2. 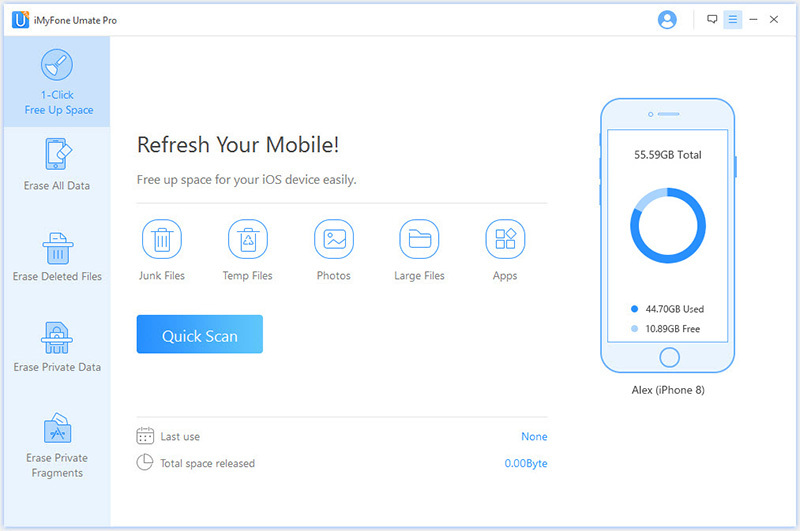 From the home interface of iMyFone Umate Pro, choose the Erase All Data mode, and click the Erase button on the next screen. Step 3. Now there are two things you need to do on the next screen. First, you will need to select the Security Level of deletion. There are three levels; Low, Medium, and High. It is recommended that you use High level because your purpose is to remove spyware from your iPhone. Secondly, you will need to type ‘delete’ in the textbox. Step 4. Once you have configured everything, you can then click the Erase Now button to start the data erasing process. Does iPhone Need Antivirus? How to Keep It as Private as Possible? Learn How to Block Spyware on iPhone at Here!